By using a forms processing system from Southampton-based Kendata Peripherals, the rheumatology department at Queen Alexandra Hospital in Portsmouth has made a dramatic reduction in the time taken to enter the data from its regular outpatient activity survey. Indeed, the impact of the TELEform system has been such that the department is now preparing to move from an annual 'snapshot' survey to a full-scale database of all outpatient activity - something that would have been unthinkable before the system was installed. 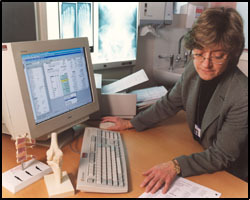 The rheumatology department has carried out the 4-week snapshot survey every year since 1989, and over that time it has evolved from a completely manual undertaking to a PC-based project - initially using a simple DOS database and then moving on to Microsoft Access. At first, the survey generated about 800-900 records - each with 15-20 entries covering brief patient demographic details, diagnosis, drug prescriptions and outcomes - but as the department grew, the volume of data increased to the current level of 1200-1300 records. Until recently, all the data was entered manually, and this took several weeks to complete. According to Angela Wood, rheumatology audit co-ordinator, staff time was not the only issue: "There were some interesting research questions that we wanted to look at, but we couldnt do so with the snapshot survey. What we needed was an ongoing patient database. However, that would not have been possible without adopting some sort of automated data entry technology." The department therefore looked at a number of software packages specifically developed for use in rheumatology, but concluded that they were mainly geared towards drug monitoring applications. "In TELEform, we found a system that offered greater flexibility and could be used for a number of quite different applications," said Angela Wood. The TELEform forms processing system enables users to gather, verify and process information from paper or digital sources, resulting in improved productivity, lower costs and nearly 100% data accuracy. Form designs can include fields for check-mark boxes, bar codes, printed type and hand-printed characters. As well as designing a form for the snapshot survey of outpatient activity, the Rheumatology Department at Queen Alexandra Hospital has also produced several other questionnaires for applications such as workload monitoring and small clinical audit projects. Typically, the department uses a combination of check-mark boxes and hand-print recognition fields in its form designs. One design also includes a signature field, whereby TELEform calculates the percentage of the box that has been filled in to determine whether or not the form has been signed. Completed forms are scanned, then after having been processed and verified by TELEform, the data is transferred directly into the department's Access database or into an Excel spreadsheet, depending on the application. "The biggest benefit we've gained from TELEform so far has been the time it has saved in executing these various projects," commented Angela Wood. "The data-entry task for the snapshot survey has now been cut from several weeks to just days, and this reduction has paved the way for the introduction of the ongoing database of outpatient activity."